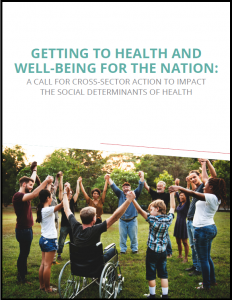 The National Alliance to impact the Social Determinants of Health (NASDOH) has released a new white paper providing insights in to their action plan to systematically create a supportive policy environment to address social determinants of health. The paper introduces NASDOH’s plans to bring clarity to the current understanding of the issues, challenges, and opportunities for the health care system to address social determinants in concert with communities and the public and private sector. NASDOH has released the first in a series of issue briefs designed to address key issues and advance our national efforts to address social determinants of health. 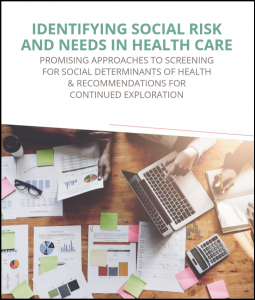 Foundational to addressing the social determinants of health is the identification of social risk through screening tools, which is the subject of this first brief. Leavitt Partners released a white paper that examines physician attitudes towards social determinants of health (SDOH), current barriers to addressing SDOH in the clinical environment, and recommendations for how to consider patients’ social needs without contributing to physician burnout. The paper discusses findings from a national survey of 621 physicians and found that while the majority of physicians believe SDOH matter for their patients’ health, most physicians do not believe it is their responsibility address these SDOH. You can view the white paper here. NASDOH co-conveners, Governor Mike Leavitt and Karen DeSalvo, discuss the importance of addressing the social determinants of health to effectively transform and improve health care and health outcomes in a Modern Healthcare opinion piece. The article highlights the need for a unifying force that includes public, private, technology, and business sectors to successfully address social determinants of health.